Hey, Does This Look Like Anyone You Know?!? And here Dr. Malcolm thought taking dinosaurs off Isla Sorna was the worst idea in the long, sad history of bad ideas. I have bad news for that unemployed architect who thinks he’s hitting the big time with his sports arena shaped like Conor McGregor’s beard: plans are already in place to erect a stadium resembling Khabib Nurmagomedov’s furry hat. And if you’re thinking, “It’s not a hat, ignorant dumbass, it’s a papakha,” I will gladly argue the point just as soon as I finish my existing squabble with Bellator MMA correspondent, Steve Juon, over whether or not a waistcoast can be called a vest. 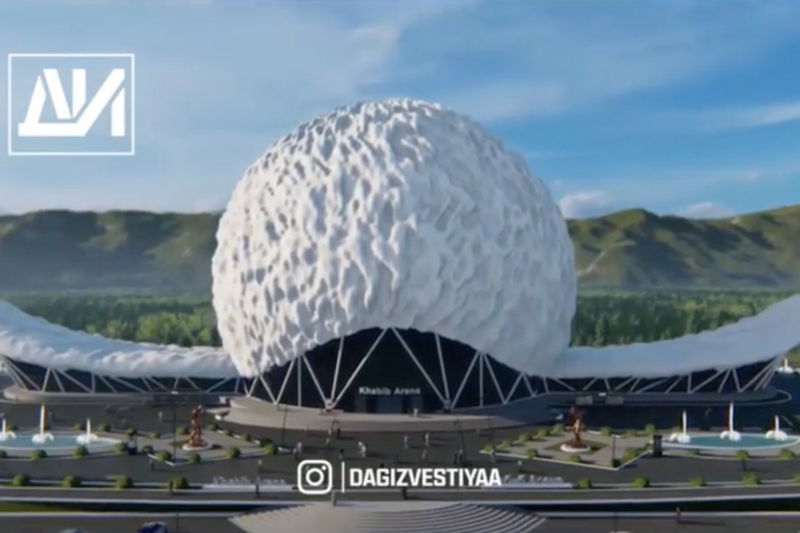 Anyway, Karim Zidan over at Bloody Elbow has the details on this ridiculous venue, affectionately labeled “Khabib Arena,” which will seat 7,000 sports fans and also include gyms, training facilities, a hotel, and a museum that showcases Dagestani athletes. Just so we’re clear, I don’t think it’s a dumb idea to construct an arena in honor of an athlete. Heck, we have a Rocky statue just outside the Philadelphia Museum of Art. My issue is trying to make it look like a furry hat, because the spec photos instead look more like my old popcorn ceiling when my toilet started leaking. Not surprisingly, some local residents are not in favor of the proposed eyesore venue, undoubtedly a major factor for phase two: seeking approval and funding. If and when it does come to light, maybe this wish will finally be fulfilled?!? UFC darling Paige VanZant won’t be fighting for any belts anytime soon, because, you know, she’s not the best fighter. But she is for sure the absolute best at crossing over into the mainstream and soaking up whatever opportunities come her way. She nearly won “Dancing With the Stars”. She’s been on TV like crazy. And now she’s appearing in the Sports Illustrated Swimsuit Issue. Because she’s Paige VanZant – what else would you expect? Anyway, she posted some behind-the-scenes to her Instagram. I think she’s doing okay. What do you think? He won TUF 21, but you can’t hold that against him now. No, not after Kamaru Usman beat the ever-loving crap out of champ Tyron Woodley for five full rounds. Woodley has been a pretty okay champ. He’s got no charisma, so the division has suffered a bit because of it, but whatever. Woodley is a tough, talented dude. And Usman made him look like a chump. Throwing the kitchen sink in round 4!! Maybe Woodley had an “off” night, maybe Usman is just that good. Regardless, now we’re going to get to see Usman destroy Colby Covington, and that’s good. The post UFC 235 Results: Kamaru Usman Makes Tyron Woodley Look Like a Chump, Takes Belt appeared first on Caged Insider. It Looks Like Conor McGregor vs. Cowboy Cerrone Might Happen… For a Belt! If Instagram posts are to be believed, then it seems like the match-up between Conor McGregor and Donald “Cowboy” Cerrone might actually happen. And for an interim belt! Keep in mind that this news tidbit is coming from Cowboy’s social media account, and for all we know, he could be on a Jack Daniels bender and shouting at clouds right now. As if there were any doubt… the Nevada State Athletic Commission took up the issue of Jon Jones today, and they decided to grant him a license to compete at UFC 235. If you’ll recall, the UFC had to move UFC 232 from Nevada to California because, well, Jones had steroids in his system (supposedly) left over from the last time he did them. And since it there wasn’t enough time to get the appropriate suitcases full of cash into the hands of appointed officials waiting in casino parking lots, the UFC did what they had to do to have Jones stay on the card. So anyway, Jones was granted his license to face Anthony Smith. He’ll have to take all sorts of extra drug tests, and pay for them himself. He’ll also be restricted to a list of certain steroids – for instance, nothing whose name ends in “-ol” (like stanozolol). The reigning UFC light heavyweight champion was granted a one-fight license to compete on March 2 against Anthony Smith in the main event of UFC 235 at a Tuesday afternoon hearing of the Nevada Athletic Commission (NAC). In a lengthy meeting that spanned over three hours, NAC officials determined that Jones will be required to be drug tested a minimum of twice a month until UFC 235, then continue to comply with a similarly rigorous testing schedule throughout all of 2019 if he wishes to fight in Nevada again. Jones will be required to pay for the additional drug tests in the lead-up to UFC 235. The post Nevada Commission Licenses Jon Jones Because They Like Money appeared first on Caged Insider.